Leamington legend Josh Blake has joined Racing Club Warwick. Josh Blake has committed to Racing Club Warwick for the season. The former Leamington, Daventry Town and Coventry United frontman joins the squad after a spell on the sidelines due to injury and manager Scott Easterlow hopes to have the prolific striker available as soon as possible. Easterlow said: “Josh has been a good friend for some time and we have been speaking for a while about him coming and we now both feel it’s the right time for him to come on-board. 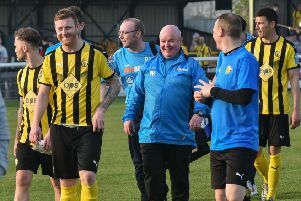 Blake was synonymous with Leamington’s rise up through the non-league pyramid and remains the record scorer for the club having notched 187 times in 406 appearances. The 37-year-old left Brakes to join Daventry Town and has also spent spells at Stratford Town, Banbury and Coventry United along with a brief stint at Townsend Meadow and says he has “unfinished business” there. He said: “I’m pleased to be back at Warwick. “I had a short stint here a few years back but the club wasn’t in as good a place as it is right now and it didn’t turn out how I imagined back then. “I feel like I have got unfinished business here. “Scott’s built a strong squad and I have I been to watch a few games and want to be a part of something they are building.